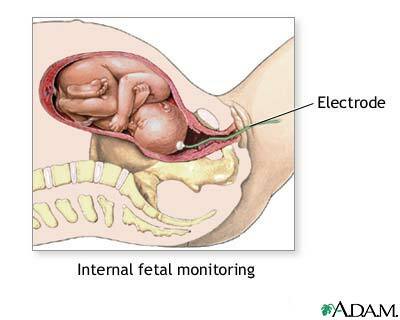 Internal fetal monitoring involves placing a electrode directly on the fetal scalp through the cervix. This test is performed to evaluate fetal heart rate and variability between beats, especially in relation to the uterine contractions of labor. Updated by: Linda J. Vorvick, MD, Medical Director, MEDEX Northwest Division of Physician Assistant Studies, University of Washington, School of Medicine; Susan Storck, MD, FACOG, Chief, Eastside Department of Obstetrics and Gynecology, Group Health Cooperative of Puget Sound, Redmond, Washington; Clinical Teaching Faculty, Department of Obstetrics and Gynecology, University of Washington School of Medicine. Also reviewed by David Zieve, MD, MHA, Medical Director, A.D.A.M., Inc.